Springfield, MA Metropolitan NECTA shown in cream color, with Springield highlighted in red. 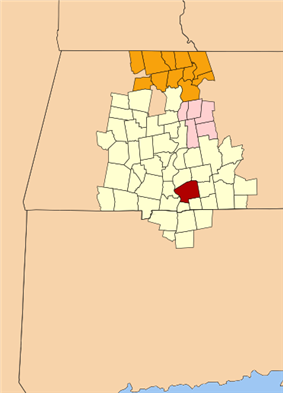 The adjacent NECTAs of Amherst (pink) and Greenfield (orange) are also shown. The Springfield metropolitan area is a region that is socio-economically and culturally tied to the City of Springfield, Massachusetts. The U.S. Office of Management and Budget defines the Springfield, MA Metropolitan Statistical Area (MSA) as consisting of three counties in Western Massachusetts. As of July 1, 2009, the metropolitan area's population was estimated at 698,903. Following the 2010 Census, there have been discussions about combining the metropolitan areas of Springfield, Massachusetts and Hartford, Connecticut, due to the region's economic interdependence and close geographic proximity (23.9 miles separate the cities' downtowns). An alternative system of measuring New England metropolitan areas has developed—called the NECTA—because, in New England, major cities and surrounding towns are often much smaller in land area than in other parts of the United States. For example, the City of Springfield is 33.2 sq. miles, whereas the City of Fort Worth, Texas is 298.9 sq. miles, nearly 10 times larger in land area than Springfield. Because of the huge discrepancy in land area, in general New England cities like Springfield feature much higher population densities. 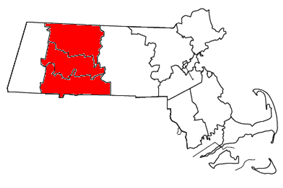 In addition, New England cities and towns have developed allegiances that transcend state borders; thus, cities in Connecticut are included in Springfield's NECTA. This system is thought to better approximate New England's metropolitan areas because it uses New England's geographically smaller building blocks. In Springfield's case, its NECTA consists of 51 additional cities and towns surrounding the city. As of the census of 2000, there were 680,014 people, 260,745 households, and 167,924 families residing within the MSA. The racial makeup of the MSA was 83.50% White, 5.96% African American, 0.25% Native American, 1.74% Asian, 0.06% Pacific Islander, 6.35% from other races, and 2.13% from two or more races. Hispanic or Latino of any race were 11.15% of the population. The median income for a household in the MSA was $42,195, and the median income for a family was $52,551. Males had a median income of $37,784 versus $28,404 for females. The per capita income for the MSA was $20,633. The Pioneer Valley Transit Authority (PVTA) is the primary operator of public transportation services in the Springfield Metropolitan Area. Headquartered in Springfield, the PVTA maintains a fleet of approximately 174 buses, 144 vans, and "is the largest regional transit authority in Massachusetts." Founded in 1974 with the enactment of Massachusetts General Law Chapter 161B, the PVTA serves 24 member communities in Hampden, Hampshire, and Franklin counties. Each member community pays an assessment fee to the PVTA based "on the number of miles served in that city or town." Alternative sources of revenue mostly originate from federal and state governments. The PVTA itself is governed by an advisory board. ^ a b c d About the PVTA Pioneer Valley of Massachusetts Transit Authority. Pvta.com. Retrieved on 2013-07-15.